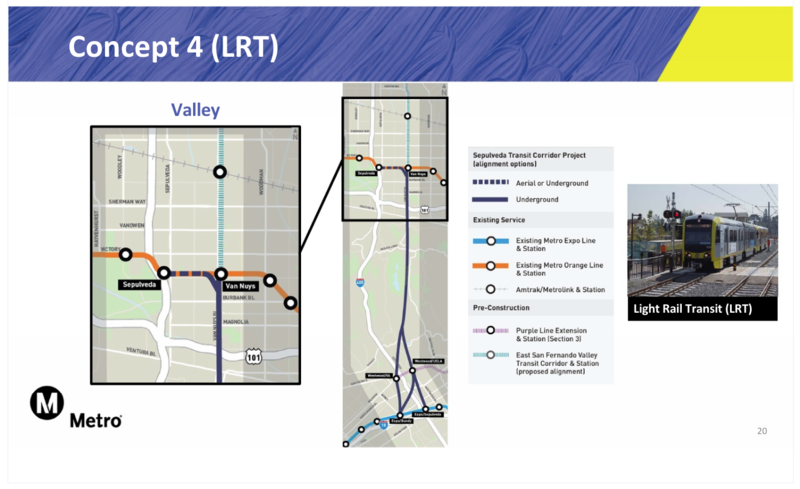 Community meetings have begun on the Sepulveda Transit Corridor Project, which will build a rail connection between the Valley and Westside before the 2028 Olympics. 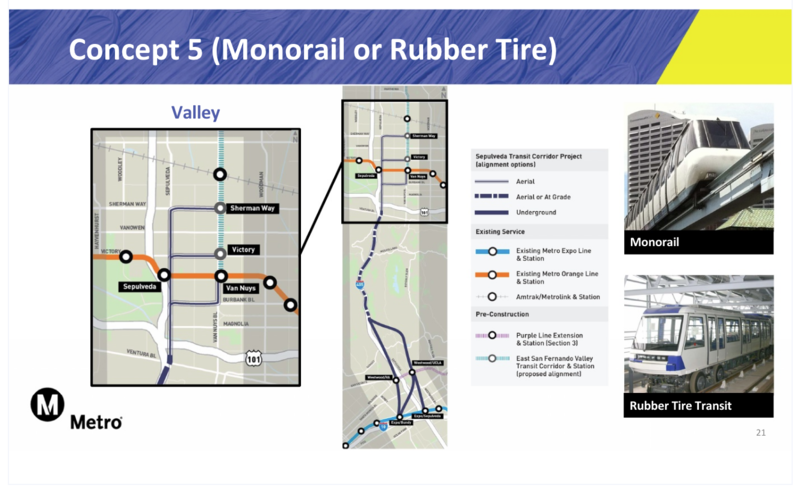 Metro unveiled six proposals for the rail line, one of which will be chosen to proceed to environmental review and, eventually, construction and operation. Not all the proposals are made equal. Some make about as much sense as a giant catapult, while others could be nearly perfect with a little tinkering. We graded all the options on potential usability, speed, and cost considerations. A subway underneath the Santa Monica Mountains will be expensive and arduous, but not without benefit. HRT, as opposed to light rail transit, can carry more riders which means trains are less crowded. The issue though is that subways and light rail trains use different tracks and power sources. Metro is planning a light rail line on Van Nuys Boulevard, so north Valley commuters traveling to the Westside would be forced to transfer at the Orange Line to ride on the Sepulveda Pass subway; a light rail line under the mountains could more seamlessly connect to the Van Nuys line. 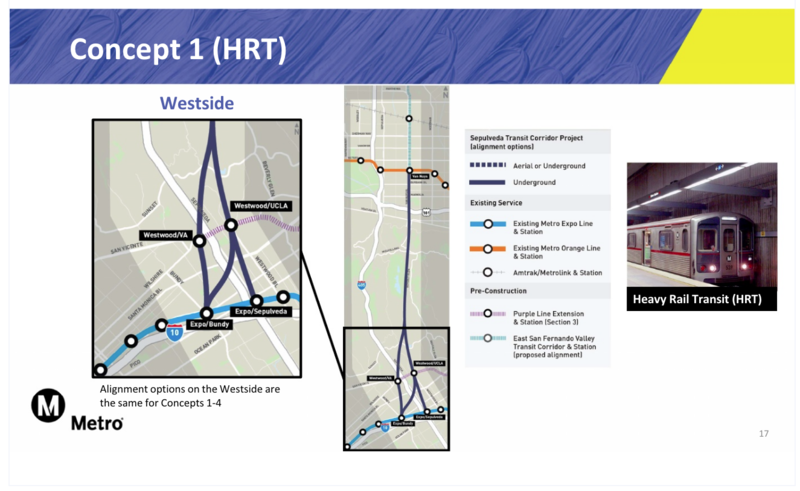 Another problem: Metro’s concept maps show the HRT line connecting to either the future Wilshire/UCLA Purple Line station at Wilshire and Westwood boulevards (the Sepulveda HRT will likely include a new station in the heart of UCLA), as well as another iteration that connects to the future Westwood/VA station. The former station is where most commuters are headed, the latter is not, and would require a transfer to access central Westwood. This variation just swaps the Valley terminus from the Van Nuys Orange Line station to the Sepulveda Station, with the options of extending to two stations on the future Van Nuys Boulevard light rail (either Victory Boulevard or Sherman Way). Connecting to Sepulveda would hopefully include a station at Ventura and Sepulveda boulevards, a busy stretch of Sherman Oaks. But this iteration would really only be useful if it does in fact stretch north to the Van Nuys line, otherwise you’re asking riders in the north Valley to transfer twice to get to Westwood. That’s a hard pass. This concept also includes the dreaded connection to the VA stop. Harder pass. Yes, light rail can carry fewer riders than HRT, but if trains arrive often enough, that shouldn’t be much of an impediment. This option also opens up the possibility of a one-seat ride from the Sylmar Metrolink, via the Van Nuys Boulevard light rail, to the Expo Line—and eventually LAX (where the Sepulveda Pass line will one day extend). Again, we have the unfortunate option of connecting to the VA station instead of central Westwood. This alignment could be very useful to commuters. 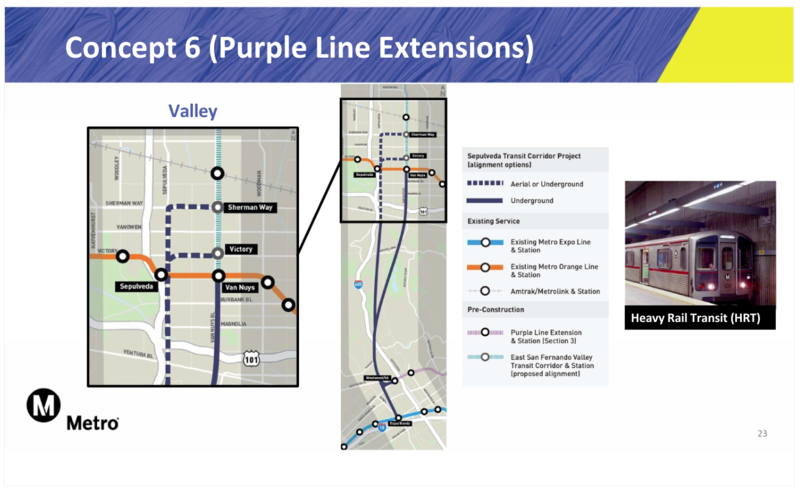 It would feature underground stations at both the Van Nuys and Sepulveda stations that connect to the Westside. You could still have seamless connection to the north Valley via the Van Nuys station, as well as a connection to the Sepulveda corridor (though not a station at Ventura/Sepulveda). A problem: This option would mean trains would be split heading to either destination, aka longer waits for riders. The VA option is also still alive for this one. 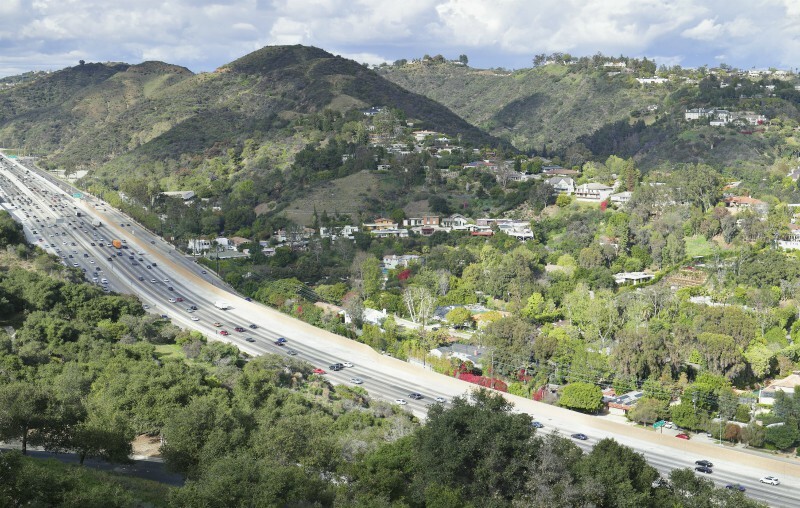 Just like it sounds, this option would put a Disney-style monorail partially underground and partially above-ground as it crosses the Sepulveda Pass. There is no other monorail in Metro’s system so this line would be incompatible with every other line and require transfers. It also seems unlikely that Bel-Air residents would be OK with a huge monorail blocking their views. Seems pretty expensive and implausible. This is a fascinating concept, allowing Valley commuters to access a huge swath of the city without transfers and on a fast underground line (imagine traveling from the Sepulveda Orange Line station to Union Station in one ride). 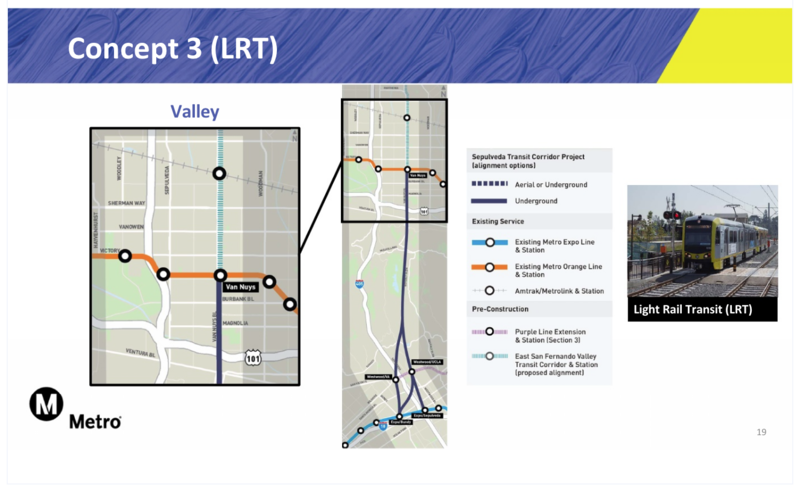 The problem is this would be expensive and force north Valley riders to transfer from the Van Nuys Boulevard light rail to access the subway (remember, different technologies). Plus, it’s not entirely clear how the Expo Line would play into this. Would there be certain trains that just go to the Expo/Bundy station, while most trains would go to Westwood and continue east to DTLA? And, as readers have pointed out, this option leaves out a direct station at the UCLA campus. That’s a big problem, especially considering the 2028 Olympics (an earlier version of this story graded this option as an A-). RELATED: Can Metro Really Complete These 4 Rail Projects Before the ’28 Olympics?